As a specialist in automation processes, machining units, hand held power tools and abrasives, SUHNER has expanded its wide product range with special tools that can be mounted directly to the robot arm. 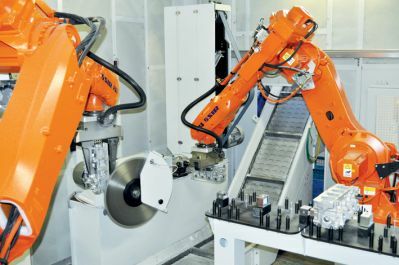 Thanks to a quick-change tool adaptation system, a number of powerful machine tools can be connected directly to the robot, ready for continuous industrial use. Today, most robot-guided grinding and polishing machine tools are operated by air. Often, considering a 24 hours operating environment, these machines reach their limits. Frequent service interruptions plus extremely high air consumption adds to energy cost that also will affect profitability. In addition, air driven tools drop in speed when under load which can contribute to an adverse effect to the surface finish. Depending on surface quality requirements, the rotation of the grinding or polishing tool often requires clock- and counter clock rotation which an air driven tool can't accomplish. All of these critical requirements can be met with the newly designed servo driven tools from SUHNER either in standard or excenter design version. Light weight and powerful servo motors are used to obtain high speeds up to 12,000rpm with timing belt drive components made for continuous operation. Adapter flanges facilitate exchange and attachment to all robot flange designs. Delivery includes a servo control module. All grinding tools are made with an M14 spindle to enable the use of commercially available grinding discs. Just like SUHNER machining units, robots can easily be adapted to perform different tasks in an ever-changing production environment. Flexibility and adaptability make SUHNER a perfect partner for robot applications.